Yesterday, Top Shop in Oxford Street became the latest target on the high street as protesters blockaded the store as part of the campaign for tax justice. 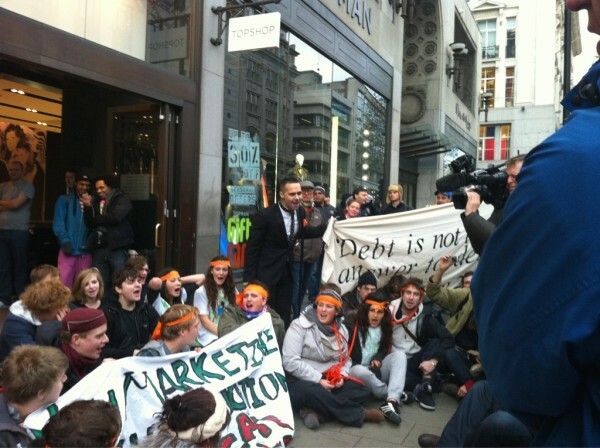 Protesters blockaded the store chanting "Philip Green, national thief, pay your tax or we won't leave!" and "Philip Green's taxation could pay for Education". There's good reason to target Top Shop, whose owner is Sir Philip Green (knighted under New Labour and brought into government by the coalition). A previous target was of course Vodafone and its missing £6 billion, as exposed by Private Eye. Tax justice campaigner Richard Murphy also makes a good case for taking an interest in the tax paid by Marks and Spencer on his TaxResearch blog, under the title 'Knickers to Tax'. Either way, it means protesters this weekend scouring the High Street for blockading opportunities, shouldn't struggle for legitimate targets. I was invited to speak at the launch of the Centre for Progressive Economics (CPE) at Queen's University in Belfast on Saturday, and I'll post links to some of the papers and my own contribution once they're online. On the same day of course, south of the border, over 100,000 people marched through Dublin in a huge demonstration against the austerity measures there. If you want to see the impact Osborne's cuts will have there is no better crystal ball than Ireland. CPE is an excellent initiative, bringing together academics, activists and trade unionists to put forward an alternative to the discredited neo-liberal economics that continues to dominate mainstream discourse. The CPE has similar aims, politics and organisation to LEAP, and I hope LEAP and the CPE will learn from each other and share information and research over the coming months and years. The Centre for Progressive Economics has been established following discussions between the labour movement and a number of academics in Northern Ireland and beyond. The discussions identified the need for a progressive economic and social analysis to counteract the disappearance of labour and left focused research in third level institutions and its replacement by a neo-liberal orthodoxy. In response an ad hoc labour and progressive think tank has emerged to comprising trade unionists and academics with a broad remit to identify relevant issues for labour and broad progressive politics. The Centre for Progressive Economics seeks to promote a genuine debate within our political, policy and public/media discourse about the ‘economy’ and ‘economics’. ‘Economics’ is not synonymous with the ‘free market’ or ‘neo-classical economic thinking’, and the ‘economy’ is not synonymous with ‘capitalism’. At this time of global economic crisis and the literal bankruptcy and socially negative impacts of ‘business as usual’ economics there is a pressing need for fresh thinking about our economic future. This is an alternative and the Centre for Progressive Economics will seek to provoke debate as to that future in the Northern Ireland regional economy and beyond. The propaganda that accompanies the cutting, slashing and burning of government spending is all about “securing the fragile recovery”. It is used in every country from Iceland, Greece, Ireland, Spain, to the US and Britain – to justify what in effect adds up to crashing the economy. But don’t get the idea that anything else can be done within the capitalist framework. After decades of credit-led expansion, the logic of capital now demands its opposite – ruthless contraction. It turns public pronouncements into lies, and politics inside out. Ireland’s government won’t be the last to find itself in trouble. The economic trajectory of country after country, region after region confirms the slide from recession to depression. The Organisation for Economic Co-operation and Development last week cut its forecast of UK economic growth in 2011 from 2.5% to 1.7%. The Institute of Directors is forecasting UK growth of 1.2% next year. In real terms, these figures represent a decline in activity. The eurozone, having pumped billions of euros into recovery measures, achieved relatively strong second-quarter growth of 1% to the surprise of the markets. But the “recovery” was short-lived. Despite the export of capital goods from Germany to China, growth slowed to 0.4% in the third quarter. Euro zone unemployment rose to 10.1% in September and it is forecast to go higher next year. In the United States, another round of “quantitative easing” – aka printing money – is under way in an increasingly desperate bid to boost economic activity. The World Bank predicts that China’s growth will slow in 2011 from attempts to constrain the country’s uncontrollable credit boom. Lending by its vast, unregulated underground financial market is sending the prices of staple foods soaring and triggering social unrest. The average price of 18 staple vegetables is 62% higher than a year ago. Inflation is eating away at incomes not only in China. Commodity speculators have driven up the price of food worldwide, while transport and energy prices in Britain are set to soar. The inexorable fall in consumer spending power – VAT is going up to 20% in January – can only deepen the contraction. Desperate times lead to panic measures, as the so-called rescue plan for Ireland’s bankrupt banks shows. Ireland, however, is only an extreme example of the rotten core of the global financial system, which has been on state life support since 2008. All the talk of the dangers of “contagion” and the threat to the euro itself indicates that another crisis-point has been reached. Modern bourgeois society, with its relations of production, of exchange and of property, a society that has conjured up such gigantic means of production and of exchange, is like the sorcerer who is no longer able to control the powers of the nether world whom he has called up by his spells … In these crises, a great part not only of the existing products, but also of the previously created productive forces, are periodically destroyed. No amount of counter-propaganda against spending cuts can halt the inexorable contraction of the global economy. Avoiding the consequences means that the system must be replaced as a matter of urgency. Today’s general strike in Portugal against budget cuts and student actions in Britain against soaring tuition fees are only flashes of the struggles ahead. Going beyond resistance to putting an end to capitalism is the real challenge. The Tax Justice campaign has rightly increased its prominence in the current debate about cuts - thanks mainly to the incredible work of the Tax Justice Network and also of the PCS union (which represents staff working in tax collection for HM Revenue & Customs). The most serious estimates are that around £120 billion in tax is evaded, avoided and goes uncollected - mostly from those most able to pay; big business and wealthy individuals. This is consistent with leaked Treasury papers in 2006, which estimated the tax gap between £97-150 billion. When the country has an annual deficit of an admittedly high £155 billion, then missing around £120 billion of tax (before we even start collecting increasing some rates) every year is substantial. There is also a certain hypocrisy at a time of unprecedented cuts that the rich are evading and avoiding tax while the poor are getting pay freezes, benefit cuts and losing their jobs. This hypocrisy is even greater when a Cabinet of millionaires is using tax havens to avoid paying their way - as opposed in the recent Channel 4 Dispatches programme, How the Rich Beat the Taxman. Such is the success of this campaign that every Party now at least pays lip service to tax justice - yes even the Liberal Democrats and Tories. However, the Labour Party (well it's conference rather than shadow Cabinet so far) has gone a bit further: passing the resolution below at the 2010 conference in Manchester. The resolution passed was a composite, but based on the draft motion circulated by the LRC, and passed by Streatham CLP, and others, much of which still remains. Sadly though, some unions were influenced by former Treasury ministers who repeated the ridiculous (HM Treasury) line that the tax gap is only £50 billion. Nevertheless, this is a victory that we must build upon - and ensure the Labour Party starts speaking up on tax justice. (Perhaps someone should pass them this though too - Richard Murphy's 'Why HMRC has got the tax gap wrong'). Conference notes that in his speech of 17 August George Osborne, Chancellor of the Exchequer, said “anyone who is serious about tackling the nation’s debts needs to come forward with an alternative plan”. Conference believes strongly there is a credible alternative to the Chancellor’s Budget which many economists predict will hit poorest families hardest and increase the risk of economic slowdown, higher unemployment and a potentially disastrous ‘double dip’ recession. Conference notes the HMRC high net worth unit tasked with investigating the tax affairs of the super rich has been cut by 20% - showing this isn’t a priority for government. Conference notes tax avoidance, tax evasion and uncollected taxes are depriving the Exchequer of up to £50 billion a year when the national deficit is £160 billion while we are faced with cuts. Conference believes that action against tax avoidance is a crucial part of tackling the fiscal deficit and if carried out effectively would reduce the level of cuts to public spending needed to meet the government economic plans. Conference believes that an increased commitment to public investment coupled with a focused attack on tax avoidance will do much to keep unemployment down and to tackle the deficit. Conference notes the vigorous campaign on PubCos and Tax avoidance schemes. Conference opposes the rise of VAT to 20% announced in June’s Budget. Conference notes the statement in the Labour Party manifesto highlighting the importance of tackling tax avoidance. Conference urges Labour to commit to addressing the tax gap as part of its deficit reduction strategy. Conference calls on the Labour movement to work to ensure that the coalition Government takes action to reduce as far as possible the level of tax avoidance by individuals and businesses in the UK as a means of ensuring that all members of society play a part in helping to reduce the deficit. In the Guardian's front page article on a UK happiness index (UK happiness index to gauge national mood, 15th November 2010) a Downing Street source is quoted as saying; "If you want to know, should I live in Exeter rather than London?...and if you have a big enough sample, and more than one [survey] a year, then people can make a proper analysis on what to do." But if everyone chooses to move to e.g. Exeter, what will that do to the quality of life of people in Exeter? It is not just the increased demand for schools, and public services, what will that do for house prices, and local jobs, and what will the people of Exeter feel about all these newcomers, since no one asked them? This quote reveals the model of society of those now in government: society is like a big supermarket. You make your selection based upon the national equivalent of a comparison web site and buy what you want. No thought of anything beyond the wants of the individual consumer, where the actions of any one economic agent have no discernible effect, and nothing is considered except the individual (economic) transaction. Nectar points anybody? Unemployment fell slightly in the last quarter - but only because a growing army of temps and part-timers masked the true picture. The latest Office for National Statistics data showed unemployment fell by 9,000 to 2.45 million in the three months to September. However part-time employment rose by 142,000 - the fastest rise on record - taking the total to 7.98 million, 5.94 million of them women. And the number of 16 to 64-year-olds described as "economically inactive" now stands at 9.27 million. The TUC warned that the figures showed no sign of a recovery despite claims that the private sector is leading an economic resurgence. General secretary Brendan Barber said: "While any fall in unemployment is welcome, it would be dangerously naive to believe that these figures constitute a jobs recovery. "The overall rise in employment is based on shaky foundations with a notable rise in involuntary part-time work. "With unemployed people outnumbering job vacancies by five to one it's time the government focused on helping them back into work, rather than insisting that the labour market is flourishing." Job vacancies fell 27,000 to 453,000 over the quarter. Left Economics Advisory Panel co-ordinator Andrew Fisher said the figures made grim reading for workers and the unemployed, particularly with the VAT rise due to come into force in the New Year. "The underlying data reveals there are 62,000 fewer people in full-time work, but 94,000 more in part-time work," he said. "But there is other bad news too. The number of vacancies in the economy has again fallen - and all this is before the bulk of the job cuts announced in the spending review have been implemented. "With no strategy for job creation, the coalition government will make 2011 a year of rising unemployment and misery for millions." Trade unionists also had little to celebrate, with only a 2 per cent average pay rise including bonuses across all sectors. The Coalition government is a coalition in name only, it is pursuing a Tory agenda. That agenda is the same as it has been for 30 years: an attempt to roll back the post-war settlement - removing welfare rights and cutting public services. While most of the attention and opprobrium has rightly been aimed at the £80 billion of cuts announced by George Osborne in the Comprehensive Spending Review, there has not been enough attention and analysis of the privatisation agenda. The level of privatisation already announced are mind-boggling, both in their scale and economic ineptitude. The CSR announced the intention privatise the Royal Mail, the Tote, Royal Mint, Ordnance Survey and air traffic control. Of course this agenda is not new, and in fact is most a regurgitation of what New Labour announced in the 2009 Budget (which LEAP rightly condemned). These aren't referred to as privatisations, but as "asset sales", but why would a country in debt, according to Osborne on the "brink of bankruptcy", sell off revenue generating assets? Each of the Royal Mail, the Tote, Royal Mint and Ordnance Survey generate income for the Exchequer - vital in closing the deficit and paying off the debt. But, as Irish comedian Jimmy Cricket used to say, "c'mere, there's more": under the radar there's a huge swathe of privatisation planned for the NHS (as this wonderful video shows), for education (through 'free schools') and in welfare delivery where nearly 10,000 Jobcentre workers are set to lose their jobs and more jobcentres close to fund the private sector to deliver workfare programmes. The Morning Star also features on its front page this morning a new report from the influential ResPublica think-tank which calls for "the government to privatise swathes of hospitals, schools and libraries". It is, as the Star titles it, "The Ultimate sell-off"
As I told the Star, the Tories plan is "to relieve the state of the burden of providing high-quality services". But that is only one side of the story - the other is that they wish to transfer publicly funded assets to the private sector. We should never forget, privatisation is the redistribution of wealth from the public to the private; from communities to shareholders. It increases inequality by removing access to services from the poorest and by increasing the wealth of the richest. Most workers have taken a pay cut over the past year, with the average deals lagging well behind inflation at 2 per cent, the Labour Research Department revealed today. One in six pay settlements involved a wage freeze, with many workers not getting a pay rise for the second successive year. Only a minority of deals kept pace with RPI inflation, which peaked at 5.3 per cent in April, and these mainly involved long-term agreements with a built-in inflation link. Pay rises in private firms - such as inflation-beating deals at Jaguar Land Rover (5 per cent) and South West Trains (5.2 per cent) - remained exceptions to the rule due to high-density unionisation. The report also revealed that public-sector workers faced pay freezes and there were plans to "undermine" wage bargaining in sectors including agriculture, schools and health. The findings come just over a week after a study by Incomes Data Services, which said that over 80 per cent of pay settlements were actually real-terms cuts to workers' wages. Labour Research Department pay and conditions researcher Lewis Emery said the research showed that disparities in pay could widen between "those able to push for a pay deal at least close to the level of inflation and the rest where job security and minimum standards become the over-riding priorities." Leap co-ordinator Andrew Fisher said the evidence had to be put into the context of the overall cuts agenda. "With utility bills, rail fares, food prices and housing rents all set to rise there will be a real squeeze on household income, especially as job losses increase too," he said. "Wages as a percentage of GDP are already at a post-war low, while corporate profits are at a high. "There is no economic reason why workers should accept pay freezes." Communist Party of Britain general secretary Rob Griffiths said workers were being made to pay for the economic crisis and faced a "clear choice" on how to deal with it. "With big increases to come in VAT, public transport and energy prices workers are faced with a clear choice - either defend their living standards and our public services or to let the corporate fat cats get away with crime of the century," he said. "Workers, pensioners, the unemployed, students and benefit claimants are being called upon to pay the bill for bailing out the banks, boosting corporate profits and funding massive increases in directors' salaries and bonuses." Osborne pronounces his cuts will mean half a million public sector job losses, which the Chartered Institute for Personnel and Development says will be nearer 750,000. But before he does that his government is attempting to tear up the redundancy terms of civil servants, so that they can be sacked on the cheap. For those that do remain, their pensions will be cut and he will perpetuate the lie about ‘rising’ and ‘unsustainable’ costs, when in fact the costs are falling as the Hutton report showed. Workers will also face a pay freeze for two years – a real terms cut of nearly 10%. There is no strategy to create jobs, and rising unemployment is implicitly accepted. Since there will be a knock-on effect on the private sector from cutting public sector investment and capital spending, another million people will be out of work, and eligible for various elements of welfare. Osborne is ahead of the game here, having now announced £18 billion of welfare cuts since June. Those still eligible to claim jobseekers allowance will face delays, a poor service and privatised contractors paid by results, profiting from your misery. Then of course there’s the problem of getting to a Jobcentre since the network will be “rationalised” (i.e. cut). It will mean a bus or even train ride for many now – and the fares are about to skyrocket, as bus subsidies are cut and rail companies have been allowed to raise fares by 30% over the next four years. There are further cuts to housing benefit and a huge hike to 80% of market rates for new social tenants (there won’t be many since the budget for new housing has been halved). Yet Osborne of course does nothing about private landlords’ inflated rent demands or investing in council housing. This is a recipe for mass homelessness. There are already 1.8 million families on council waiting lists and 100,000 families living in temporary accommodation. For those on Incapacity Benefit, Employment and Support Allowance or Disability Living Allowance there are cuts and privatised profit-making and target-driven assessments to shift sick and disabled people onto the lower Jobseeker’s Allowance. So Osborne is demonising those on benefits, and introducing new workfare policies, when there are already 2.5 million unemployed and less than 500,000 vacancies. His answer is that the Big Society will step in – the social equivalent of laissez-faire – yet voluntary sector funding is being cut by central and local government and the Charity Commission (which regulates the sector) received a budget cut of 33%. In case of any media dissent, Osborne has cut the only major not-for-profit broadcaster, the BBC, by 16%, while cutting the regulation of private media through cuts to Ofcom. If that wasn’t enough, Osborne will also be handing over public assets like the Royal Mail, the Tote, Royal Mint, Ordnance Survey and air traffic control to his mates in the City. All of these bring in revenue to the Exchequer, and that’s why they are attractive to big business. This government will also soon allow market rates of interest on student debt, making it attractive to the private sector, and the CSR again proposed privatising the student loan debt which will be big money once that debt amasses at £7-12,000 per year. Osborne also announced he is giving up on child poverty – “the Spending Review has no measurable impact on child poverty over the next two years”, he proudly announced in his speech. There are currently nearly four million children living in poverty, and that will rise as more of their parents lose their jobs and have their benefits cut. So it’s class war, all-out class war, and so to mitigate against people becoming aware of that Osborne is taking two logical steps – firstly lying about the necessity for cuts, but secondly to divide and rule: between public sector and private sector workers, and between those in work and those out of work. There is a third step too – the devolution of many cuts to local government to implement, dividing the blame. We therefore have to challenge each of these strands if we are to mobilise effectively. We must re-but his lies, and explain the alternatives at every opportunity: public ownership, tax justice, a wealth tax, a million climate jobs, etc. We also have to not let ourselves be divided – and say that there should be no cuts – not in welfare, public services, jobs or pensions – and no privatisation and marketisation of our public services. The question of councils implementing the cuts needs serious discussions. In May 2011, Labour is likely to gain more councils as the backlash bites against the Tories and their Liberal lapdogs. These newly elected councillors will need to consider how they can resist the cuts. It’s a discussion that local LRCs and community anti-cuts campaign are having now. Osborne has unleashed an all-out class war. If we are to defeat this we need to bring our trade unions and the Labour Party back into struggle – otherwise what do we replace this government with? It is not going to be easy, but there really is no alternative. *This is the second part of an article that appears in the November 2010 issue of Labour Briefing. To analyse the coalition government’s Comprehensive Spending Review (CSR) we have to understand its purpose. Was this the economic strategy to get "our country back from the brink of bankruptcy" as George Osborne said in the final rhetorical flourish of his Commons statement? Let’s analyse that claim. As a sovereign country with its own currency bankruptcy is near-impossible – we can always print more money. But that technicality aside, Britain would have to be in unprecedented levels of crisis to become functionally bankrupt. The UK’s national debt is lower than that of Germany, France, the US – and about a quarter of Japan’s! Our debt, currently 56% of GDP is not high by historical standards, and we are able to borrow over long repayment periods at low rates. Our debt is nowhere near high risk. Osborne and many monetarist economists would argue that the deficit – the annual gap between expenditure and revenue – is however a problem, wider than that of many nations and at an historically high level. He said in the Budget that the deficit was the result of Labour’s profligate public spending, amassed “from a decade of debt”. A quick check of the figures proves this to be untrue. Labour inherited a national debt of 42% in 1997, which had been reduced to 29% by 2002, and rose slightly to 36% in 2008. Then the global banking crisis occurred and the deficit rocketed as unemployment rose, tax revenues collapsed and welfare spending increased. But whatever the reasons, it is perhaps true that “tackling this budget deficit is unavoidable”. It is certainly desirable – as otherwise debt will increase and interest payments will eat further into spending and curtail useful expenditure. 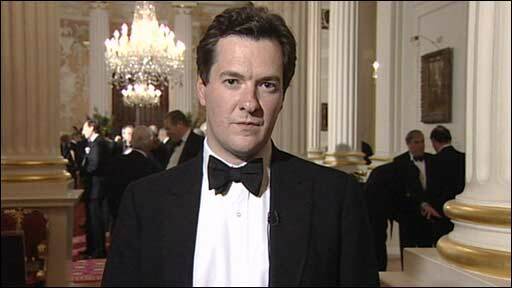 If we accept that dealing with the deficit is desirable, that still does not make Osborne’s choices unavoidable. There are three ways to deal with the deficit: I’ll characterise them as Marxist class war, Keynesian, and Osborne’s class war. Each could achieve the goal of closing the deficit, they are political choices. The first is the ‘Marxist route’ – this is not deficit-denial, but debt denial – deny that we should pay. You either expropriate from the rich and big business to pay or risk the invocation of sanctions, embargos and even war by repudiating the debt and not paying at all. Argentina managed it a few years back, but it requires us to be in a revolutionary situation and we are not, yet, so let’s move on. The next is the Keynesian path. This requires restoring revenues (rather than cutting expenditure) to close the deficit. It means deficit spending, public investment, job creation, probably aligned with redistributive taxation. Of course what we got was the Osborne class war model: cutting capital expenditure, freezing pay, increasing VAT, cutting jobs and welfare, yet still expecting a private sector led recovery. It is not just anti-Keynesian, it is anti-logical. It means rolling back the state, to cut expenditure to match reduced revenue. Growth is subject to a laissez-faire leave-it-to-the-market strategy, but public spending must be pared back.